Parasol tree | Infonet Biovision Home. 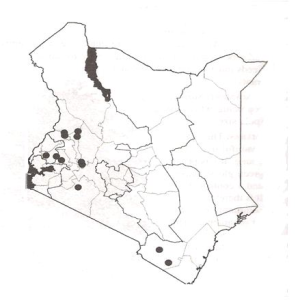 English (Parasol tree); Keiyo (Auoun); Kikuyu (Mutati); Kipsigis (Aounet); Luhya (Mwanzu); Luo (Nyakom ondiek); Maasai (Olyalilingi); Marakwet (Auoun); Meru (Mukurukuru); Nandi (Soiyet); Ogiek (Muachet); Sabaot (Ewondet); Taita (Mkanya); Tugen (Auwe). It is native to; Angola, Botswana, Burundi, Cameroon, Central African Republic, Democratic Republic of Congo, Ethiopia, Ghana, Guinea, Kenya, Lesotho, Malawi, Mozambique, Namibia, Nigeria, Rwanda, Sierra Leone, South Africa, Sudan, Swaziland, Tanzania, Togo, Uganda, Zambia and Zimbabwe. 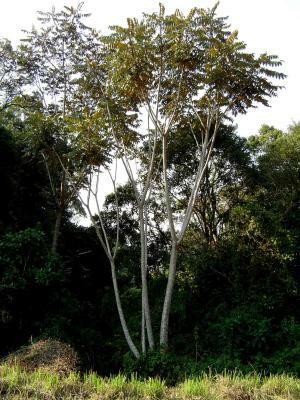 Its a tall forest tree widely distributed in wetter highland forests into the bamboo zone and southwards to southern Africa, Found in the tea growing areas of Kenya, often left in plantations (Mau, Tigoni, Nandi, Elburgon, Nyambene, Solai). It can be grown with crops, e.g. banana or coffee. The high crown lets in light and the leaves produces good mulch. It is becoming rare due to overexploitation and planting should be encouraged. No smell thus good for containers. It is also used for beehives making. Altitude ranges between 1180 and 2500 m above sea level, mean annual rainfall is between 1500 and 2000 mm and the tree is distributed in agro-ecological zones I - II. It may be established in mixed farming or natural management systems. Wildings or seedlings may be used to propagate it. It's a fast growing tree. Fuel: The firewood of Polyscias species is of poor quality. Timber: Wood is soft, white, odourless and not durable; used to make food containers, tea chests, veneers, plywood, beehives, utensils, musical instruments and mole traps. Medicine: Leaves have useful medicinal properties. Soil improver: Leaf fall provides good mulch, with soil under the tree being quite fertile. Ornamental: The decorative tree can be grown in amenity areas. Intercropping: The high crown lets in sunlight, making the tree suitable for intercropping with crops such as banana, coffee or cocoa. There is no information about diseases that affect it. This may be so because is not a serious problem.